Cheech Kit.Includes: One red knit beanie cap, brown shoulder-length wig and bushy brown fake moustache. Available Size: One Size Fits Most Adults and Teens. *Shirt, Suspenders, Pants and Shoes Not Included. Sold Separately. Get that funny and well-known look of Cheech y Chong's Up in Smoke with our adult Cheech Marin Costume Kit. It will make you feel VERY funny! 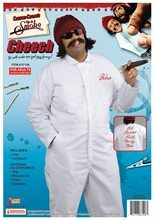 Our funny Cheech Costume Kit includes a red knit beanie cap, brown shoulder-length wig and bushy brown fake moustache. This funny Cheech costume kit was designed after the style his character Pedro de Pacas wore in Cheech y Chong's Up in Smoke movie. The movie chronicles the exploits of the two stoners as they travel south of the border seeking the perfect marijuana hash stash. Cheech Marin is a comedian and actor who gained fame from his part of the comedy act Cheech & Chong during the 70s and early 80s. Cheech Adult Costume.Includes: One red knit beanie cap, costume wig with brown shoulder-length hair, bushy brown fake moustache, sleeveless yellow crop tank shirt and red suspenders. Available Size: Mens - Standard. (One Size Fits Most Adults) *Cigar, Pants and Shoes Not Included. Accessories Sold Separately. Re-live your favorite moments of Cheech y Chong's Up in Smoke with our adult Cheech Marin Costume. It will make you feel VERY funny! 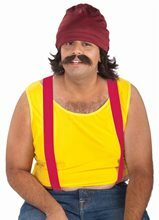 Our funny Cheech Adult Costume includes a red knit beanie cap, costume wig with brown shoulder-length hair, bushy brown fake moustache, sleeveless yellow crop tank shirt and red suspenders. This funny Cheech costume was designed after the outfit his character Pedro de Pacas wore in Cheech y Chong's Up in Smoke movie. The movie chronicles the exploits of the two stoners as they travel south of the border seeking the perfect marijuana hash stash. Chong Kit.Includes: One red paisley printed bandana, brown character wig and brown fake goatee beard and moustache set. Available Size: One Size Fits Most Adults and Teens. *Shirt, Glasses and Accessories Not Included. Sold Separately. Create your own favorite memories from Cheech y Chong's Up in Smoke movie with our adult Chong Costume Kit. It will make you feel VERY funny! Our funny Chong Costume Kit includes a red paisley printed bandana, brown character wig and brown fake goatee beard and moustache set. The fake beard and moustache set features a self adhesive back for easy application. This funny Chong costume kit was designed after the style his character Anthony Stoner wore in Cheech y Chong's Up in Smoke movie. The movie chronicles the exploits of the two stoners as they travel south of the border seeking the perfect marijuana hash stash. The Big Smoke Joint.Includes: One Big Smoke Joint. *Costume and Accessories Not Included. Sold Separately. 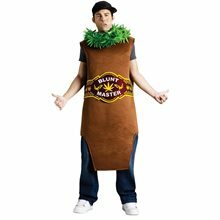 Finish off that hippie costume by smoking a fake joint with our Big Smoke accessory prop. The 60s hippie generation is well known for the peace, love and drugs for a happier place! The Big Smoke prop resembles a joint with white, hand-rolled paper and a 'lit' end featuring burn marks and ash. Carry around The Big Smoke prop to get that look of smoking marijuana with your hippie costume. 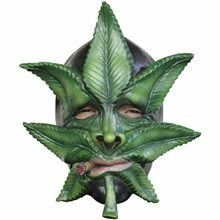 Weed Man Kit.Includes: Pot leaf mask, pot leaf cape, pot leaf cuffs and pot leaf emblem.Available Size: One Size Fits Most...Stoners.WARNING!! : This product is not intended for children under 14 years of age.Look over on the couch...it's a lethargic, channel-surfing, high-flying, would-be superhero! It's...WEED MAN!Made in China.